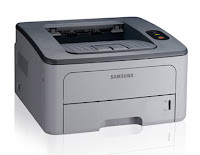 Samsung has just unveiled their new compact monochrome laser printer, the Samsung ML-2851ND. The Samsung ML-2851ND's height is only 8.5 inches and has 1200 x 1200 dpi output, and a 160MB expandable memory. Printing speeds on the Samsung ML-2851ND is about 28 pages per minute with first page output speed of 8.5 seconds. The printer also has Samsung's TonerSave mode which, according to Samsung, can extend the cartridge life of the Samsung ML-2851ND up to forty percent. The Samsung ML-2851ND has a 250 sheet cassette, 150 sheet output capacity and can handle media sizes of 3 x 5 up to 8.5 x 14 inches. The Samsung ML-2851ND is already available nationwide for $329.99.